The Wife of Bath Trilogy, 6 ft x 19 ft, 182.88 cm x 579.12 cm, oil on unstretched canvas. Alms, 43 in x 75 in, 109.2 cm x 190.5 cm, oil on unstretched canvas. The Painted Knight 5.67 ft x 5.10 ft, 172.82 cm x 155.45 cm, oil on unstretched canvas. The Wife of Bath and her Knight, 42.5 in x 75 in, 108 cm x 190.5 cm, colored conte on paper. 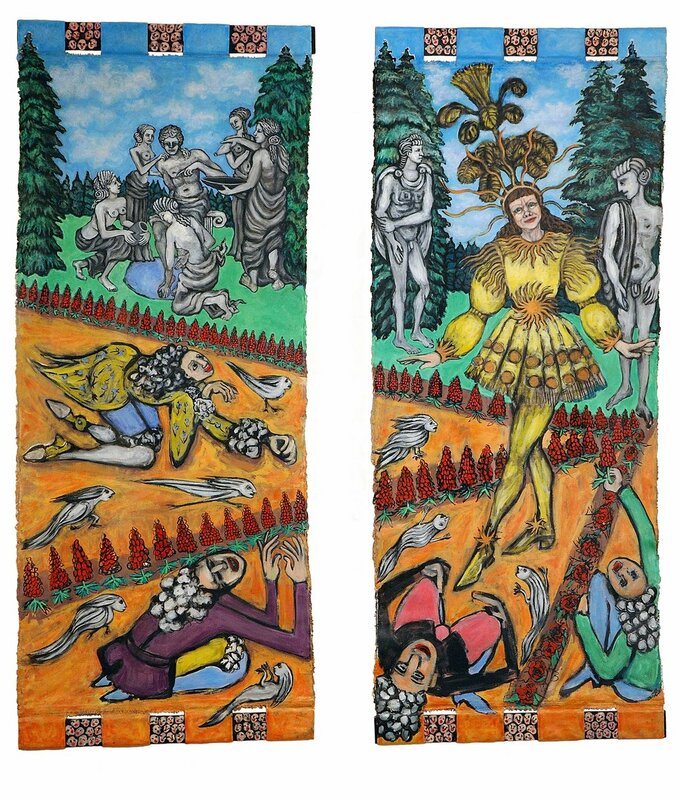 Ellen as Louis XIV as Apollo, 4.83 ft x 2 ft, 147.2184 cm x 60.96 cm each panel, oil on unstretched canvas.